This is the second in a series about author visibility. Last week I discussed some challenges indies face. 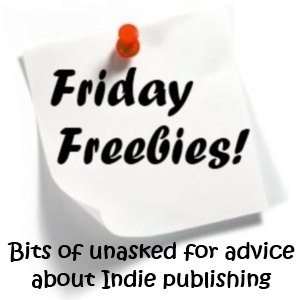 This week and next I’ll be discussing the use of freebies. That is what I was told by several veteran indie authors, various bloggers, and a whole bunch of indie websites, so I buckled down and organized several. Unfortunately, I mistranslated that statement. I thought it meant that giveaways generate sales, and I was disappointed. Giveaways DO have a place, but before you jump into one, give thought to what you hope to accomplish. The most common type of giveaway seems to be the blog giveaway. This is when a blogger features a particular book and gives away a copy which has been donated by the author. In my experience, however, I’ve found that it’s not a very effective sales method. In fact, just the opposite usually happens. The folks who enter blog giveaways usually aren’t interested in buying your book; they want it free, and by the close of the contest they have forgotten all about it. Nobody actually buys your book. Then at the end of the week, one person wins, and you have to donate a copy. If you’re donating a paperback, you’ve just lost money. With that lesson learned, I thought I’d experiment with a Goodreads giveaway. After all, those often attract thousands of would-be readers. Who wouldn’t want that kind of exposure, right? Well, notice I said would-be readers, not would-be buyers. Again, these are people with their hands out. Honestly, I’m not bashing them. I’ve entered many myself. I’m simply pointing out that this mindset is the logical reason why giveaways don’t result in sales. So I went into this new giveaway with lower expectations and a further test in mind. After a winning name was drawn and the paperback sent out, I contacted forty of the most active Goodreads members who had signed up for my contest. This is actually against Goodreads policy, but I went ahead and did it anyway for the sake of experiment. The first day, I contacted 20 people explaining that they didn’t win the paperback, but I offered them a coupon for a .99 Smashwords download of the same novel. I had absolutely no sales as a result. A few days later, I contacted 20 more members, but this time I gave away a coupon for a free Smashwords download. About five of those coupons were actually cashed in. Interesting, huh? It rather proved my point: Giveaways do not generate sales. So should we give up on giveaways altogether? Not at all. I read a post from one fellow who did this very same Goodreads experiment, only on a much larger scale and with a different motivation. He offered every single person who signed up for his Goodreads giveaway a free download of his book afterward, hoping to get some reviews posted on the site. Did you catch that? His motivation was not sales, it was reviews, and he was successful. Out of several hundred contacts, he ended up with a good handful of reviews. I forget the number, exactly, but it was like 20 or 30, I believe. That’s not bad. And that brings me to my final point: Giveaways can indirectly influence sales. Let’s go back up to that first statement: “Giveaways are a great way to generate interest and spread the word about your book.” After my disappointments, I realized there is actually a lot of truth in there. Giveaways are effective, but they aren’t the microwave recipe I thought they’d be. Rather, they’re a slow cooked meal. Giveaways work in the same way. Each feature, each review, each giveaway is one more t.v. commercial. It’s a seed planted. Few readers will buy on the first exposure, so an author must be patient, must keep planting, must keep giving away. Eventually the hard work will pay off. 1. Give books away to blog reviewers. If enough people leave enough varying viewpoints in key locations, they will influence buyers. They’ll serve as proof that someone out there was glad they took a chance on your book. Even a few negative reviews can be useful by showing genuine reactions and boosting curiosity. And, hey, it’s spreading the word. 2. Set the first book in a series free. I haven’t tried this yet, but I’ve heard lots of success stories. It’s sort of like baiting a fishing line. Lots of folks will pick up a freebie. If the book is well written, many will swallow the hook and move on to purchase book two, then three, then…you get the idea. I have set single titles free on Amazon temporarily to boost the sale of other single titles and had modest success. Since KDP, however, this hasn’t worked as well. The method seems more reliable with a series. 3. Create related content and give it away. This could include a short story featuring some of your characters, or additional scenes. Bonus material. (Think movie special features and deleted scenes.) This type of content won’t take nearly as long to put together as a novel. You simply want to create an appetizer that will draw people to your main course. As a former teacher who now writes for kids, I like to put together a collection of materials (study questions, links, vocab, extension ideas) for each of my novels that educators might find useful in the classroom. The paperbacks have a price tag, but I make digital versions free on Smashwords and Barnes and Noble. So far one has gone free on Amazon as well. As soon as it did, I started selling more copies of that novel. 4. I’ve even seen the first several chapters of a book published as an ebook and used as a free preview (though I didn’t know it when I downloaded it and was angry when I found out and refused to buy it, so if you take this road, LET YOUR READERS KNOW WHAT THEY’RE GETTING). What has your experience been with giveaways? Neither type of giveaway you mention results in immediate sales, but yes, they do have other good results. Giving your own book to bloggers results in reviews and helps to spread the word (which can impact later sales). And giving away other books on your blog is fun and a great way to reward your readers. Both good things!! !